It was a cold, rainy night about two months back when I picked up the Navi from Ashok's place. Reaching there, I found out that it had no fuel indicator and I had no clue how far it would go. Ashok promised me it would make the 30km ride from his place to mine, so pretty much fuelled by faith I started riding her back home. 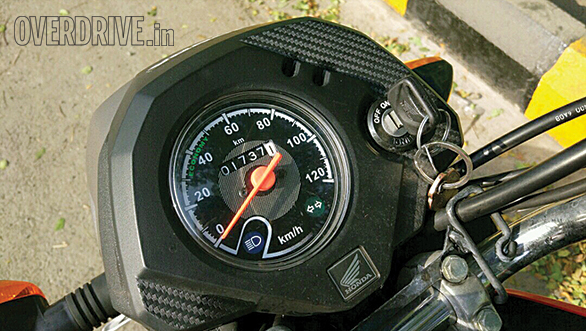 Come to think of it, the lack of a fuel gauge is perhaps the most irritating aspect of the Navi ownership. But that's already been spoken about. I'm more interested in seeing what it's like to live with the Navi. As a photographer, I'm not a part of the core testing team at OVERDRIVE but I have ridden many different two-wheelers over the years. Still, the Navi comes across as a unique experience, and it took me some time to get used to the nimble and ultra-reactive handling. The bike (scooter?) itself is so light, it's effortless to manoeuvre in most conditions. 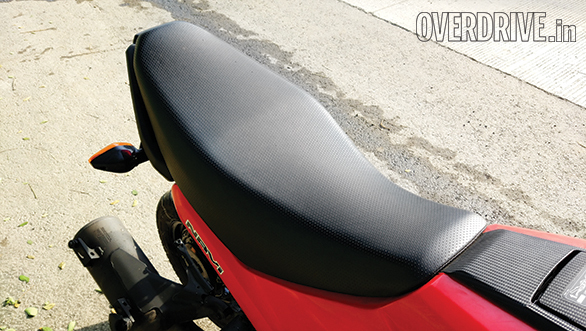 Seating is quite comfortable for a single rider, but pillions are best saved for shorter runs. Interestingly, when you carry a pillion the handling takes a turn for the worse. The extra weight on the back renders the front end too light, and what was once nimble and enjoyable becomes vague and unpredictable. 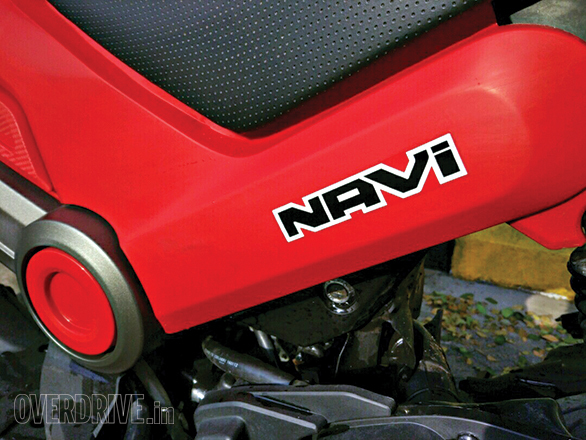 Because the Navi is such fun she is rarely ridden slowly. However, economy is still impressive, the Navi returning about 45-48kmpl in the city commute. That's roughly 5kmpl more than an Activa/Dio which uses the same engine, and added fuel efficiency could probably be attributed to the Navi's lower weight. One full tank can cover 100-120km, but you have to remember the mileage reading of your last fill-up, which I invariably forget! While I enjoy the riding experience, I'm not as impressed with the finish quality. What started as 'Patriot Red' has faded to an almost pink in the six months we have had the Navi. At the launch, we were convinced that the flimsy plastic fuel cap cover would begin to vibrate in a few months, but I'm happy to report that hasn't happened yet. I also wish the mirrors offered a wider view, but it's not a major complain and the mirrors can easily be swapped with aftermarket units. Finally, I miss the luggage-carrying capacity of a traditional scooter. Yes, the Navi has an open space where you can stuff a bag, but the lack of a hook doesn't give me the confidence to stow anything there. The Navi has just returned from the first service where she got some fresh oil and a good clean-up. 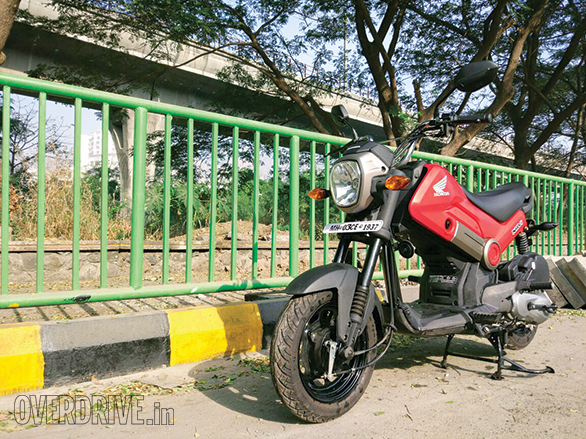 Honda charges Rs 410 which is the same that you pay for an Activa. 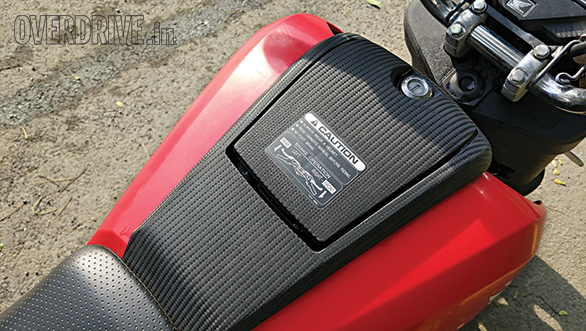 The next service comes up at 3,000km at which point Honda will be giving us some accessories for the Navi. I look forward to it! The review was first published in the January issue of OVERDRIVE.